I know we all want to help our kids focus more on Christ during December so I’m here to help you do just that. The Church of Jesus Christ of Latter-Day Saints has a campaign every year to help families focus on Christ, giving and those who need help every Christmas Season. 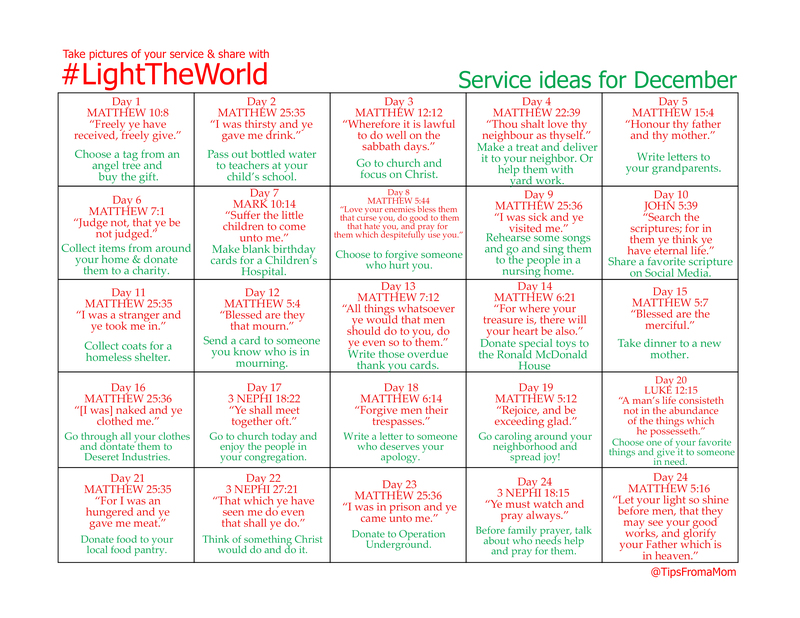 This year I’ve created a calendar (based on the calendar from the church) that includes a scripture along with an idea for service or an act of kindness that your family can perform. Every day has a service idea that is easy for families to accomplish. Follow along on my Facebook page for the daily videos for inspiration and to bring the spirit of the season into your home. You can download the calendar HERE. Just right click on the image after it opens in a new window and choose “Save Image As” and save it to your computer. Print it on cardstock and enjoy! Stick the service calendar on your fridge so the whole family can see it every day.